Live in Peace or Leave the Galaxy will highlight Bauermeister’s innovative use of text throughout her oeuvre, displaying examples of words crafted by Bauermeister in such diverse materials as linen cloth, gesso, ink, straws, and printed paper and further activated, for example, by the illumination of a light box or the magnification of optical lenses. These mechanisms illustrate the transformative quality of language and the imaginative opportunities for multiple and multi-dimensional modes of reading and seeing; much of Bauermeister’s work depends on double meanings, puns and games created by such visual tricks. 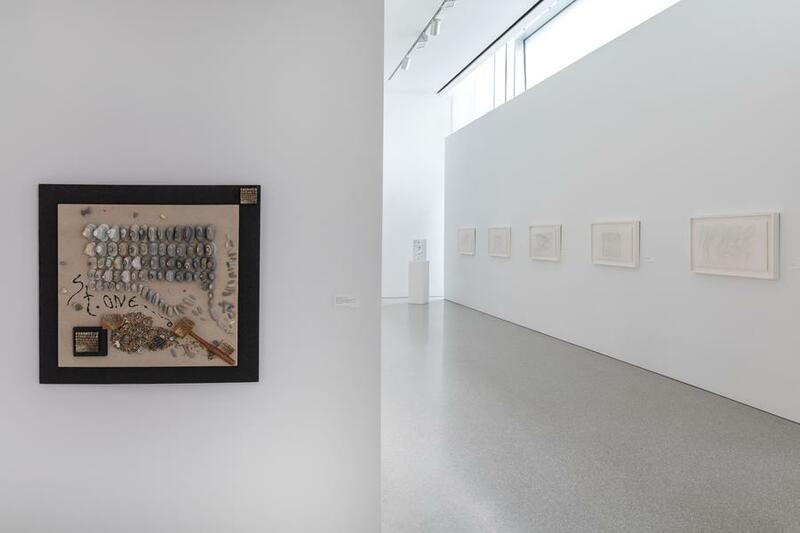 The phrases that appear throughout Bauermeister’s oeuvre are drawn from a wide range of sources that over the years have deeply informed and shaped the direction of her work. 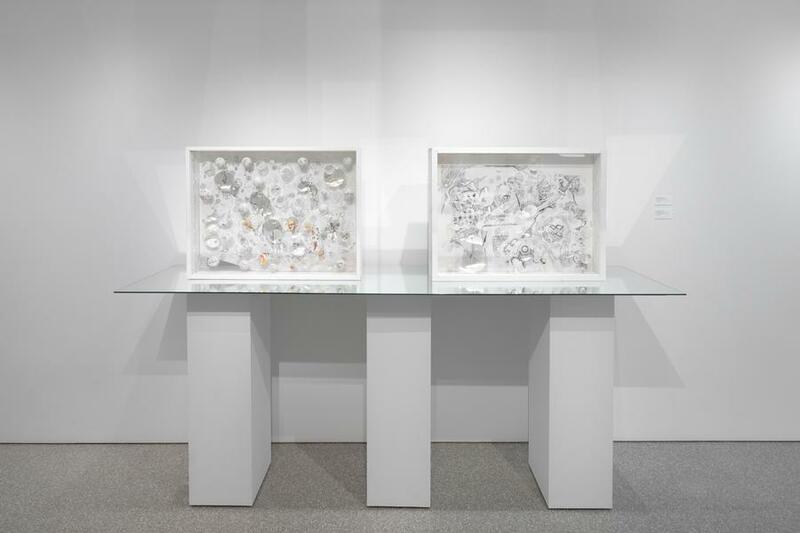 As a young girl, Bauermeister was a curious and creative student, consuming books that mirrored a variety of interests that ranged from mythology and astrology to biology and politics. The thoughts she formulated from these sources “as well as her spiritual perception of nature and personal feelings, doubts and anxieties find their way into her artistic cosmos shaped in drawings, lens boxes and sculptures.”[i] Through humor and visual puns, Bauermeister first began consciously incorporating text into her work in 1961 with handwriting so small that it was used graphically to form larger words and shapes that conveyed ideas, a form of concrete poetry that Bauermeister explains “one can read it or perceive it as a structure.”[ii] Such conceptual practices cemented Bauermeister’s seminal role within the Fluxus movement, which fostered experimental poetry, music, visual art and happenings. 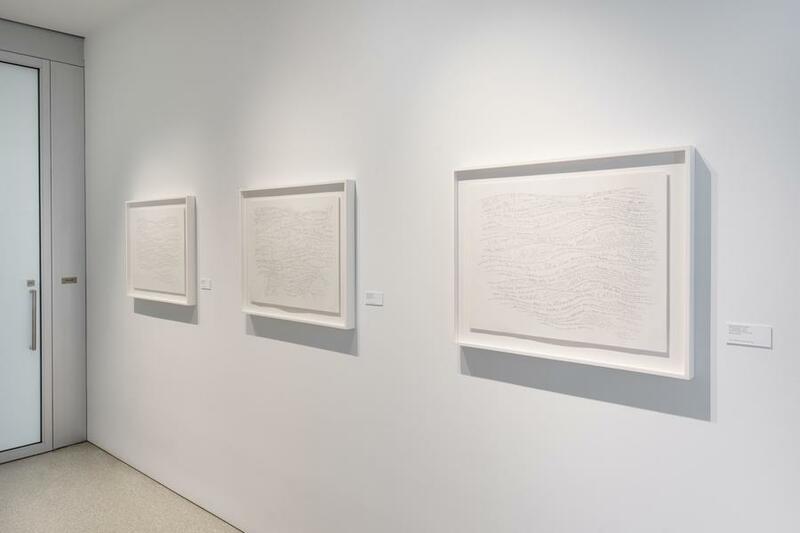 Bauermeister’s network of handwritten text is a fundamental component of her visual sphere, where she creates a galaxy strung from words as a means of translating thoughts to two- and three-dimensional space. When taking in her work, reading is just as important as the conventional act of looking. Art combined with written word mentally engage the viewer and initiate “a form of immediate communication with the mind.”[iii] A vital form of communication, language is utilized by Bauermeister as a way of asserting personal and collective presence and existence in the universe. The essential act of reading requires “the fast motion of the intellect from character to spirit, from exceptional to universal, from the surface to profundity.”[iv] Used in works simply composed of text drawings or in monumental assemblages where they play a supporting role, words, phrases and poems become a universal vehicle for consciousness, understanding and exchange. 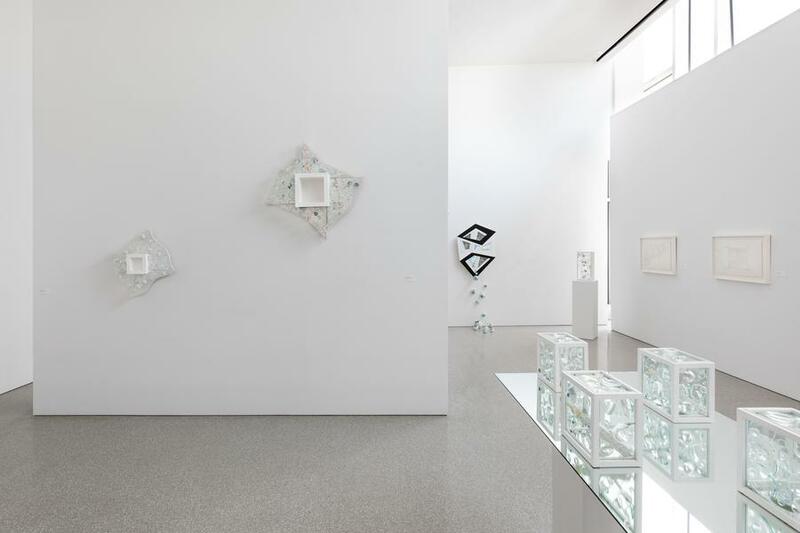 The title of the exhibition, Live in Peace or Leave the Galaxy, exemplifies this current and Bauermeister’s strong connection with spirituality, meditation and the cosmos. According to her personal history, Bauermeister once meditated together with other people in a meditation tent in an attempt to make contact with extraterrestrial beings; contact was made and the transmitted message was one that resonates to this day: “Live in peace or leave the galaxy.” The phrase makes sense of the world in which we live, a reminder to live fully and mindfully, at peace with oneself and the world at large. 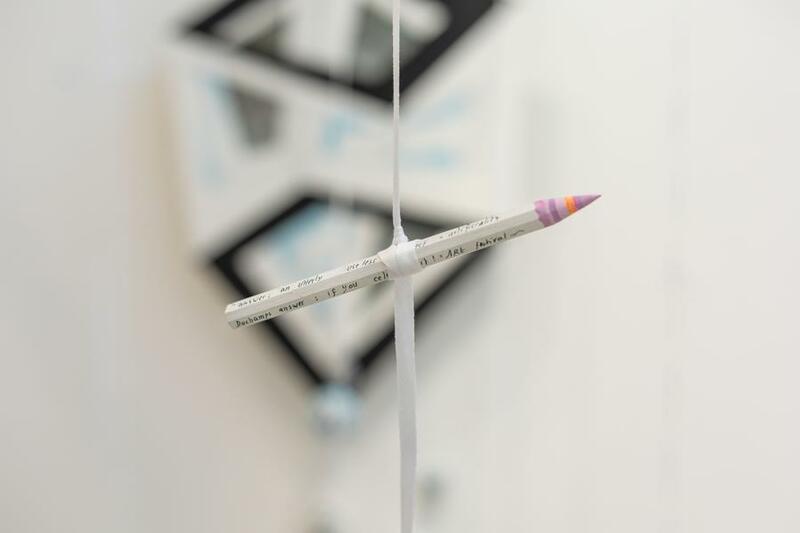 An important component of the exhibition indicative of Bauermeister’s active studio practice are the colorful pencils that the artist began making in the late 1960s. The pencils are colored by hand and vary in length and width. As a group, they resemble whimsical and magical landscapes composed of mountains, trees or buildings. Taken individually, they are no longer useful tools with which to make art, they become the art themselves. 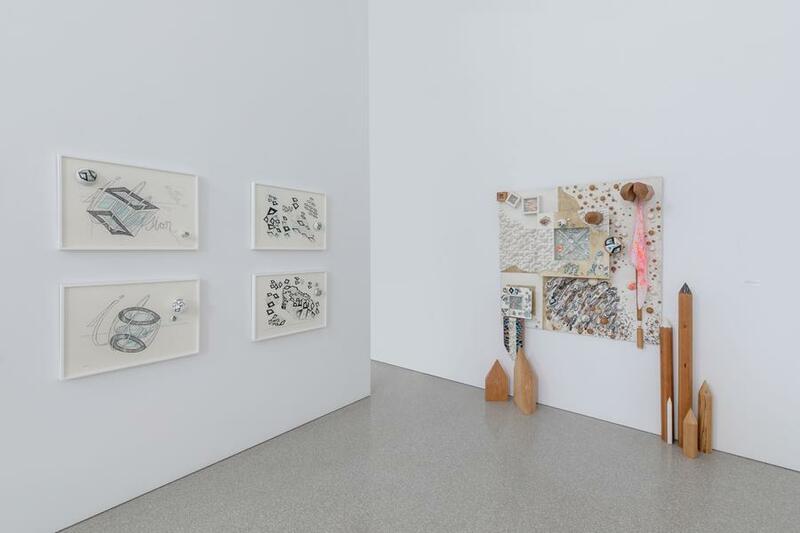 Such a paradox fits in with Bauermeister’s penchant for humor, as well as her interest in reviving a “nostalgic memory of a predigital epoch” – the pencils, and her ubiquitous writings and drawings scrawled throughout her various constructions, are a reminder of the literary and art-making tools used before the rise of computers and other forms of digitization. 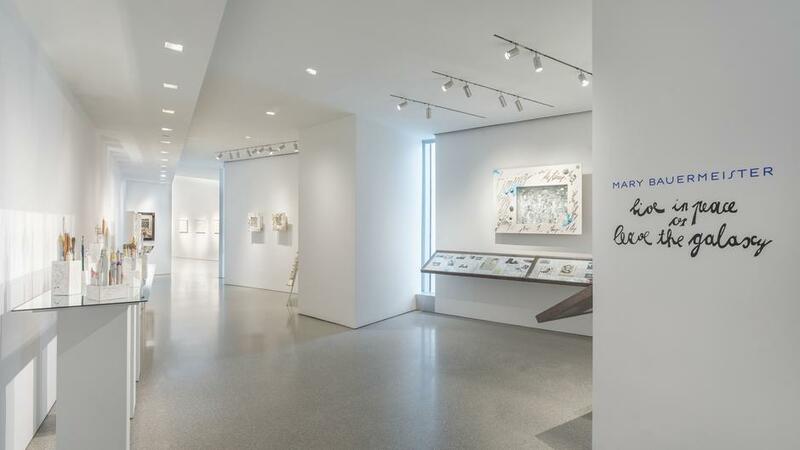 Mary Bauermeister: Live in Peace or Leave the Galaxy will be accompanied by a fully-illustrated catalogue, Michael Rosenfeld Gallery’s first monograph for the artist. 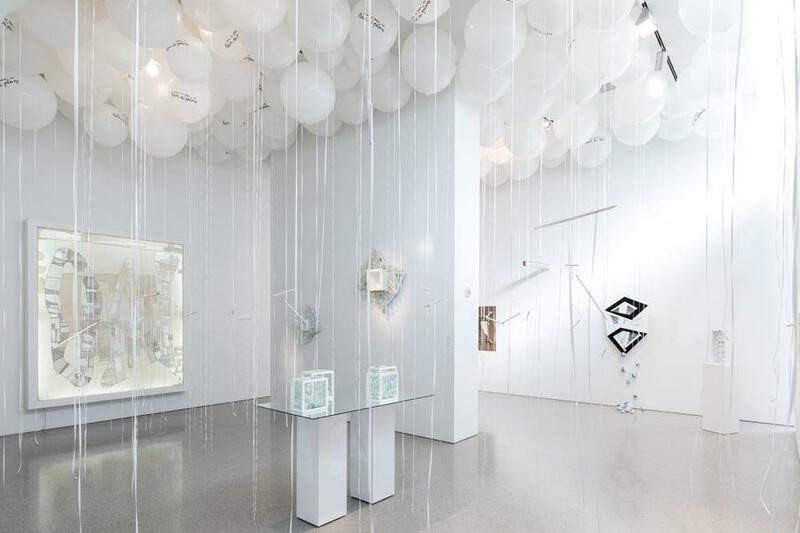 For the exhibition’s opening reception, Bauermeister will be in attendance and has conceived a happening – a nod to her early roots in the Fluxus movement – which includes a vision for the gallery to be filled with a temporary installation of helium balloons from which 50 unique artist-made pencils will be magically suspended. In the spirit of the ephemeral and ethereal quality of the balloons, “Live in Peace or Leave the Galaxy” has been printed onto them, creating an experience that reflects Bauermeister’s meditative and celestial encounter and that highlights her playful sense of wonder and joy. Throughout the duration of the exhibition, balloons will be available for inflation at the gallery. 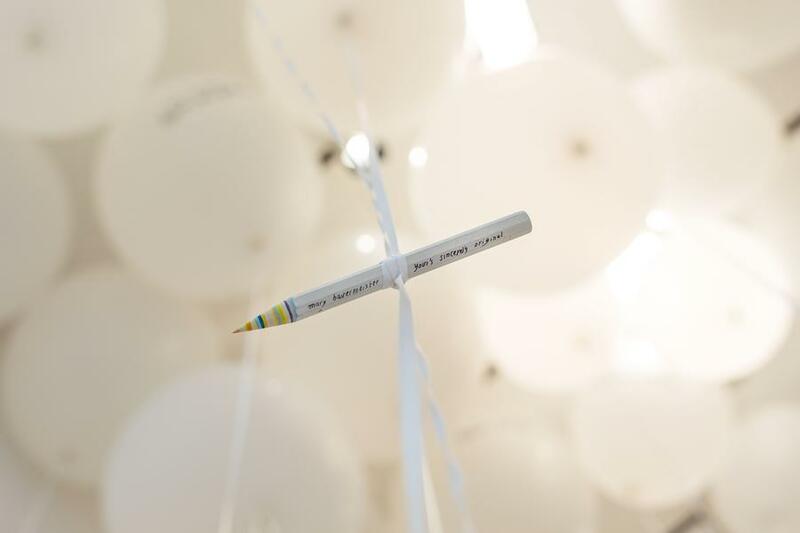 All proceeds from the sale of the pencils will benefit The Children’s Museum of Manhattan (CMOM), a premiere New York City institution, helping children thrive through programs in early childhood development, art & creativity, world cultures and health. Of her decision to donate the proceeds to CMOM, Bauermeister states “In a totally materialistic society ART is the one or may even be the last territory for creative activity and ART creates room for the non-conformative way of authentic beings, so what better cause can there be than to enable children to make contact with art and creative engagement.” This hopeful message underscores the importance of the universalizing power of language in Bauermeister’s art. In conjunction with the exhibition, the gallery is also pleased to present Simon Stockhausen: A Workshop Concert, A Tribute to his mother Mary Bauermeister, which will be held on Tuesday, May 21, 2019 at 7:15PM at The Kitchen. The interactive performance will be preceded by a reception at the gallery from 6:00-7:00PM. Stockhausen is a noted composer, musician and sound designer with an interest in exploring uncharted sonic territory, combining acoustic instruments and field recordings with electronic sounds and deriving sound and music from art works and images in general. Since 2016, Stockhausen has collaborated with Bauermeister, fusing his interests in music and art together. 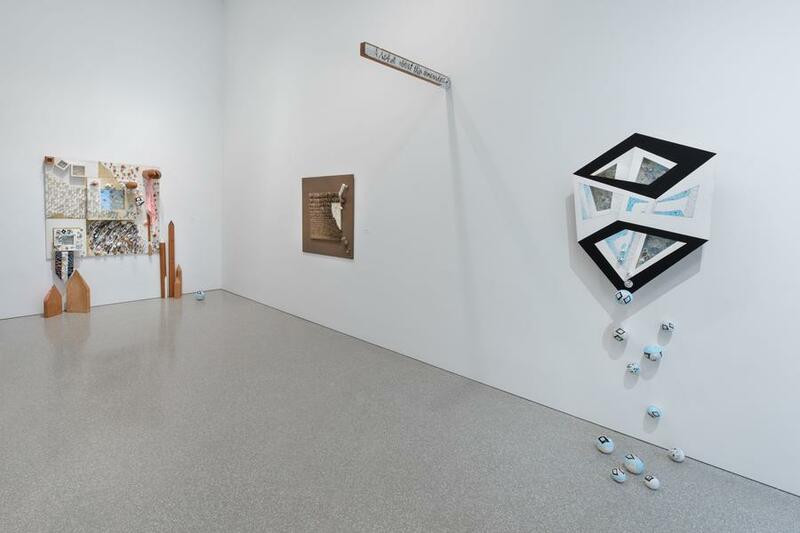 A multidisciplinary artist known for her intricate and enigmatic assemblages, Mary Bauermeister (b.1934) continues to defy categorization with layered works in a range of media. 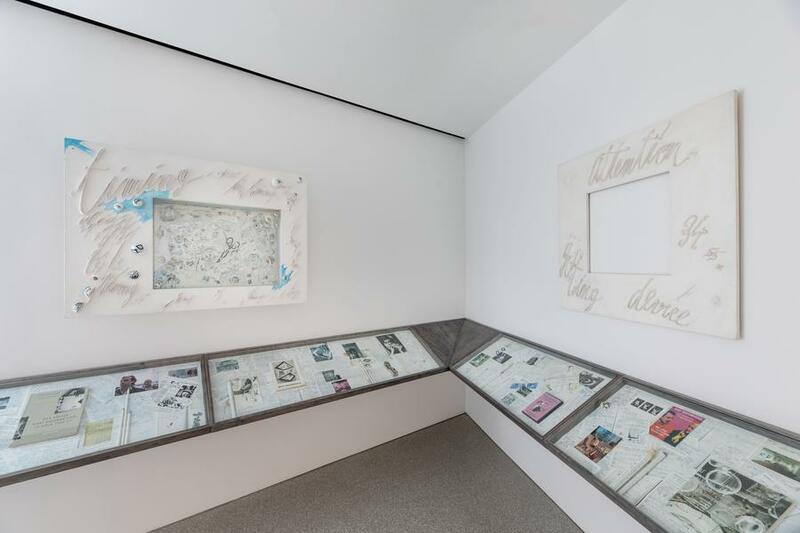 An influential figure of the Fluxus movement – her studio was the meeting point for a number of defining artists of the movement – her work plays an integral role in the discussion of art, both European and American, that emerged from the 1960s. Her reliefs and sculptures, which have incorporated drawing, text, found objects, natural materials and fabric, reference a plethora of concepts: from natural phenomena and astronomy to mathematics and language, as well as her own “spiritual-metaphysical experiences.” Maturing amidst the currents of Minimalism and Pop Art, Bauermeister’s art has resisted labels due to the singular expression of her interests and concerns, among them the simultaneous transience and permanence of the natural world with experimentations in transparency and magnification, multiplication and variation, structure and order, chance and ephemerality, introversion and extroversion. 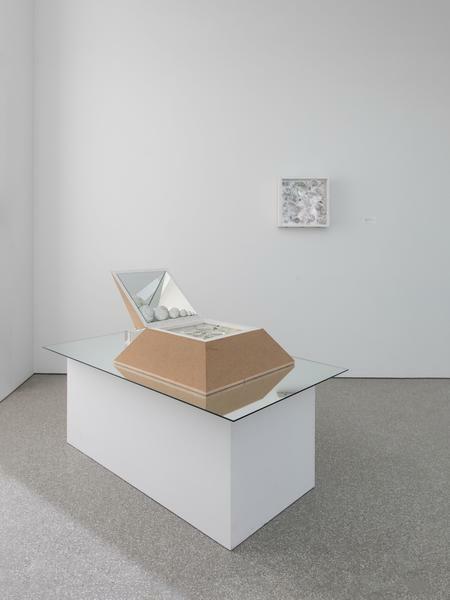 Her three-dimensional receptacles of thoughts, ideas and notes contain visual, conceptual and philosophical paradoxes that challenge perceptions and that offer literal and metaphorical windows into which one can glimpse the inner workings of the artist’s mind. Born in Frankfurt am Main, Germany, Bauermeister attended secondary school in Cologne from 1946 to 1954, where she began creating her first works on paper under the supervision of her drawing teacher, Günther Ott, an early admirer of her artistic talent. In 1954, she began her studies at the Hochschule für Gestaltung (Ulm School of Design) in Ulm, where she took courses with Swiss artist, architect and designer Max Bill and Helene Nonné-Schmidt, who had studied with Paul Klee. Unable to align herself with the school’s rigid constructive structure, Bauermeister wrote to Ott: “The only artworks which receive serious attention here are constructed, mathematically provable, rectangular…”[v] She left Ulm after one semester, registering at the Staatliche Schule für Kunst und Handwerk (State School of Arts and Crafts) in Saarbrücken and studying with photographer Otto Steinert. In 1956, Bauermeister returned to Cologne where she supported herself by selling her pastel works on paper. 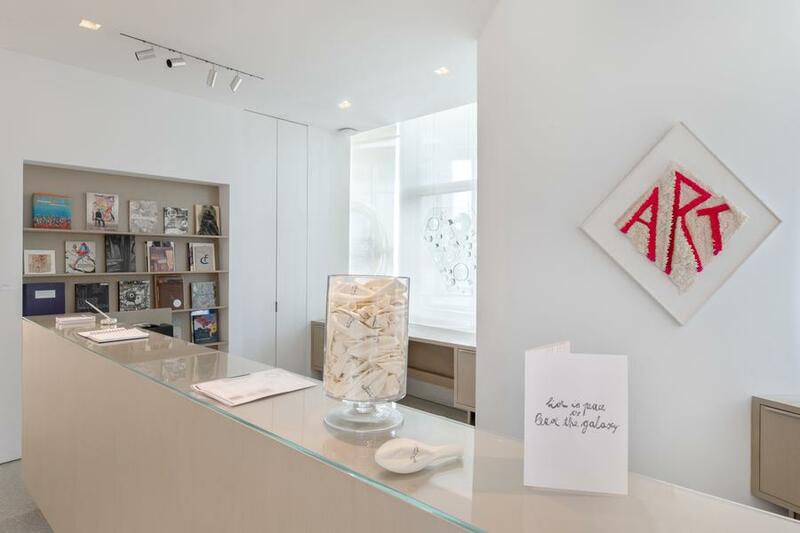 Between 1960 and 1961, she rented a studio on the top floor of Lintgasse 28, a space that fostered a cutting-edge environment, hosting numerous exhibitions, concerts and performances. Most notably, John Cage, Merce Cunningham, Nam June Paik, Karlheinz Stockhausen and other avant-garde artists, musicians and dancers convened at the studio, partaking in many of the earliest Fluxus happenings and earning Bauermeister the title “mother of the Fluxus movement.” She continued to nurture a close friendship with Stockhausen, an influential composer of electronic and serial music, with whom she also collaborated in a creative capacity; the couple would marry in 1967 and have two children, Julika and Simon. Bauermeister and Stockhausen later divorced in 1973. Two younger daughters, Sophie and Esther, were born from subsequent relationships with musician David Johnson and artist Josef Halevi. 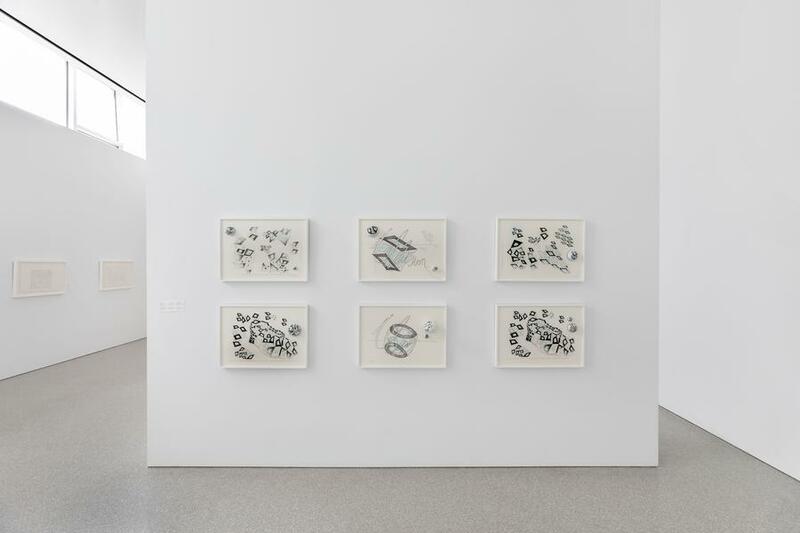 In 1962, Bauermeister exhibited for the first time in a museum setting, in an interdisciplinary display of her work from 1958 to 1962 alongside recordings and scores by Stockhausen and other composers which was held at the Stedelijk Museum in Amsterdam, The Netherlands. Organized by Jan Willem Sandberg, the museum’s director, the exhibition traveled to two other Dutch venues: the Stedelijk Museum in Schiedam and, in early 1963, the Groninger Museum in Groningen. 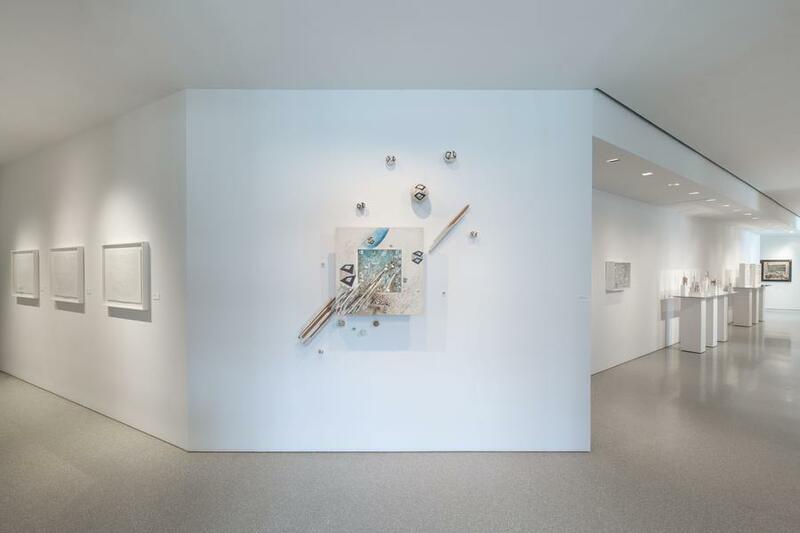 Sandberg had also mounted a concurrent exhibition, Four Americans, featuring Robert Rauschenberg, Jasper Johns, Alfred Leslie and Richard Stankiewicz. 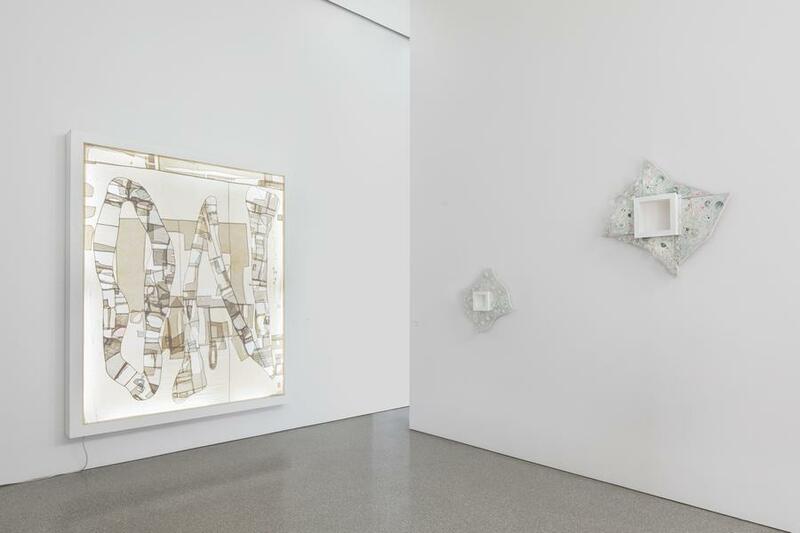 Impressed with and inspired by the work of Rauschenberg and Johns in particular, Bauermeister left Germany for New York in October 1962 at the age of twenty-nine. Specifically, Rauschenberg’s famous combine Monogram (1955-59, Moderne Museet, Stockholm, Sweden), which featured a taxidermied goat adorned with an automobile tire and mounted on a wooden platform, had a profound effect and signaled to Bauermeister the artistic freedom the United States, and New York especially, could offer her that Germany at the time could not. 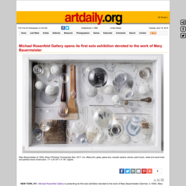 In New York, Bauermeister entered the art world swiftly, moving into a studio at the National Arts Club in Gramercy Park in early 1963 and participating in the International Artists’ Summer Seminar at Fairleigh Dickinson University in Madison, NJ later that year. 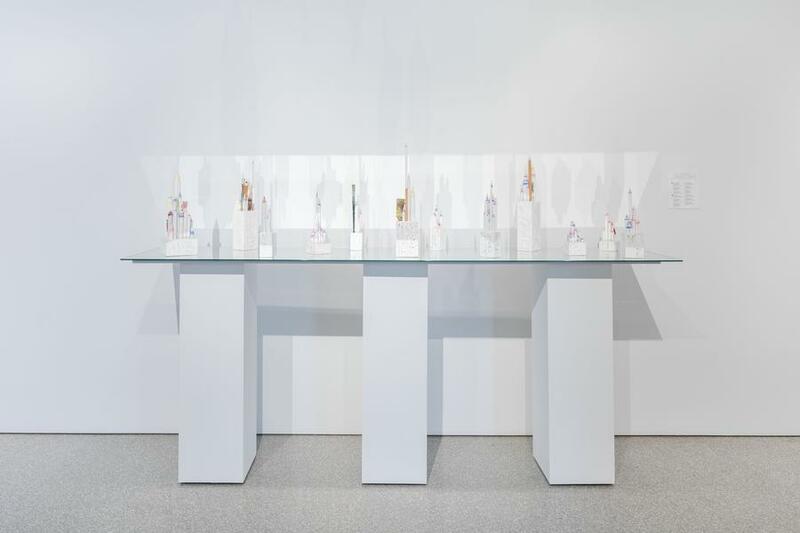 The program resulted in an exhibition at Riverside Art Museum, where budding gallerist Alfredo Bonino encountered her work for the first time. 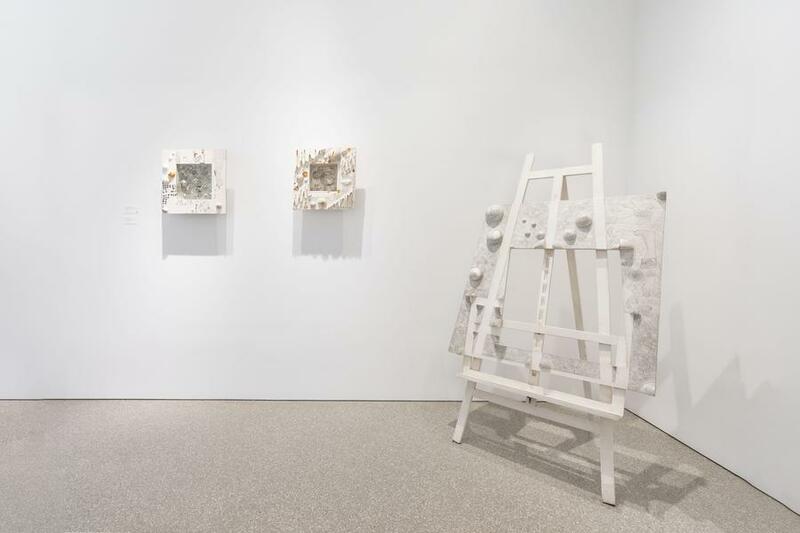 Bauermeister joined Galeria Bonino that winter and her work was initially presented at the gallery in the group exhibition 2 sculptors, 4 painters and, significantly, in her first solo show in 1964, gaining the attention of institutions and critics alike. 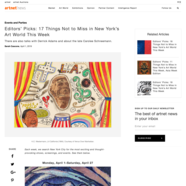 Indeed, the Museum of Modern Art, the Solomon R. Guggenheim Museum, and the Whitney Museum of American Art, all in New York, as well as the Hirshhorn Museum and Sculpture Garden in Washington, DC, all purchased examples of her work, prompting The New York Times art critic Brian O’Doherty to write: “It will be interesting to see if she has the intelligence and cunning to cope with the major success she is obviously going to have.”[vi] The exhibition included early work, as well as the pieces that would define her time in the United States: her compositions with stones, sewn pictures, and the first lens boxes. Three more solo exhibitions at Galeria Bonino, in 1965, 1967 and 1970, would follow. 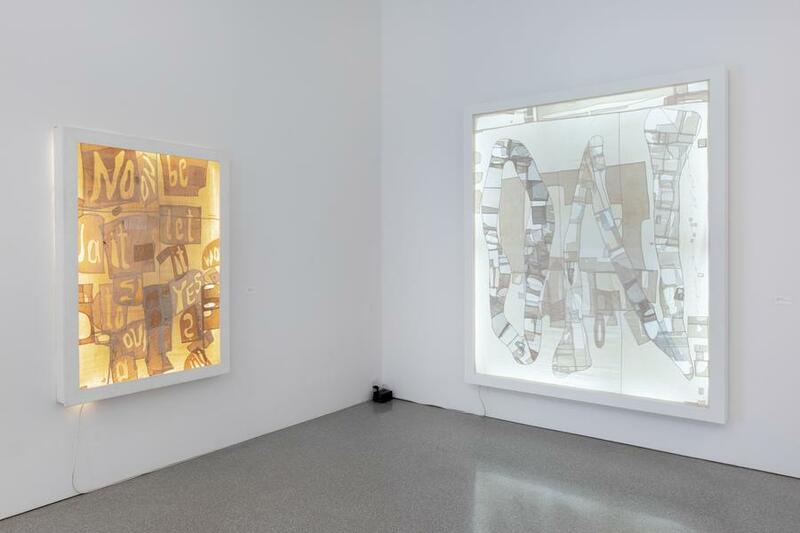 Bauermeister stayed in New York for the next 10 years, forming lasting friendships with a number of artists, musicians, choreographers and writers – in addition to Johns, Rauschenberg, Cage, Cunningham, and Paik, she also counted among her friends Ray Johnson, Christo and Jeanne-Claude, Hans Namuth and Alan Ginsberg. 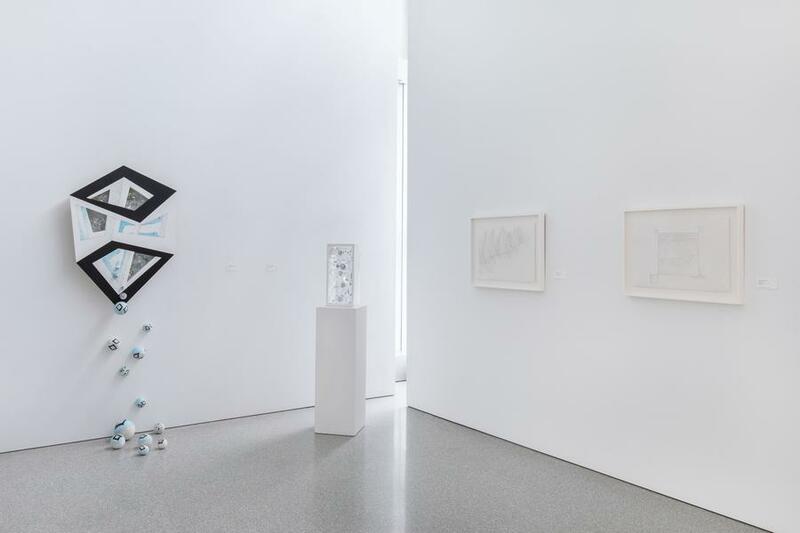 Throughout the 1960s, Bauermeister exhibited in numerous group exhibitions in the United States and Europe, including the esteemed Annual Exhibition of Contemporary Sculpture and Prints at the Whitney Museum (1966) and the seminal Pictures to be Read/Poetry to be Seen at the Museum of Contemporary Art, Chicago (1967). 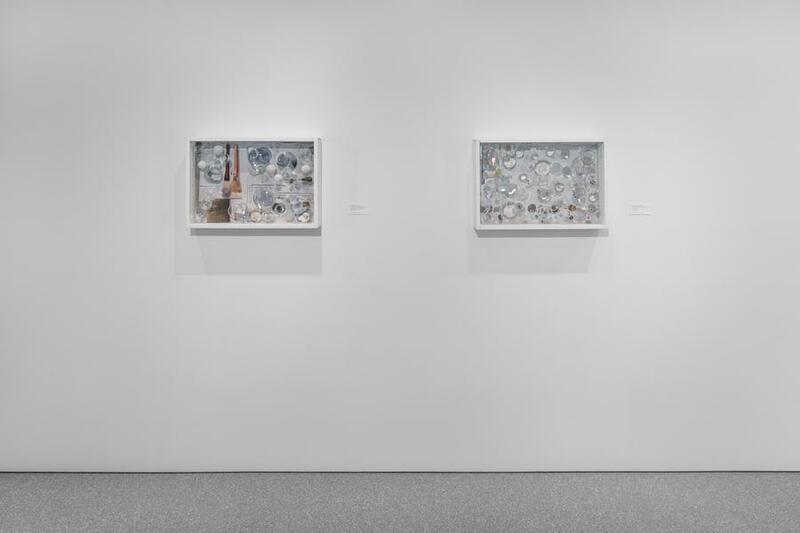 In related exhibition materials, Bauermeister was frequently referred to as an American artist, and she was included in surveys of young American artists, epitomizing the innovative influence she had on the contemporary American art scene. In 1972, Bauermeister returned to Europe, settling in the house she built for herself in 1968 in the small town of Rösrath, near Cologne – surrounded by a large garden which would inform her later work – though she would continue to visit New York on a regular basis for installations and events. 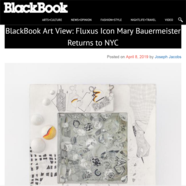 That same year, Bauermeister saw her first retrospective, held at the Mittelrhein Museum in Koblenz, Germany, which featured paintings, objects and works on paper from 1952-72. Also in 1972, she had her first solo exhibition at Galleria Arturo Schwarz in Milan, Italy and in 1974, she was given a retrospective showcasing two decades of work at the Rathaus Bensberg – the town hall – in Bergisch Gladbach. 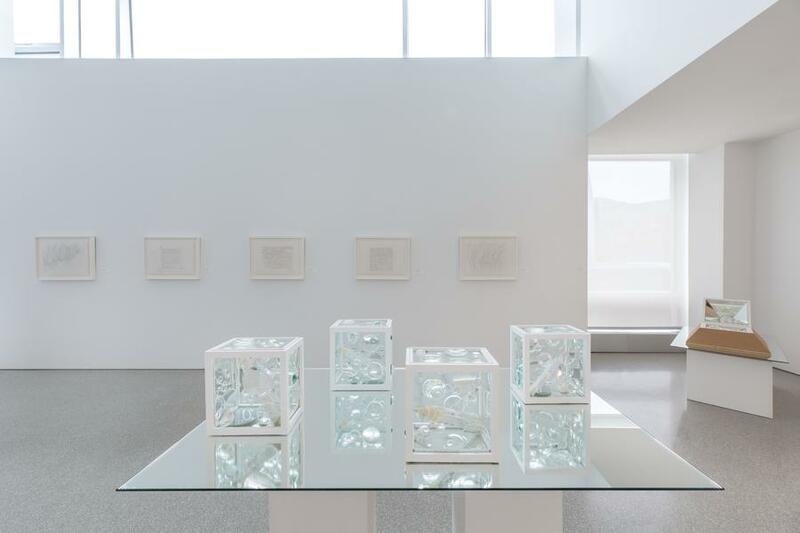 In the late 1970s and continuing into the mid-1980s, Bauermeister began working with water and crystals to design commissioned gardens, both interior and exterior, meant for pleasure and meditation. Notable commissions included the gardens she designed for the corporate offices of the Landeszentralbank Wiesbaden in Wiesbaden, Kölnische Rückversicherung in Cologne and the Federal German Foreign Office in Bonn. In 1980, the Städtische Galerie Villa Zanders in Bergisch Gladbach presented Bauermeister’s Retrospektive 1955-1980. In 1985, she was included in the International Crystallography Congress held at the Universität Bielefeld, where she presented a solo exhibition of her work and discussed the topic “Symmetries and Serial Processes in Art and Music” with faculty members of the university’s mathematics department. The following year, Bauermeister joined the Postnukleare Aktionstage (Post-Nuclear Action Days), a festival of cultural programming in Wuppertal, where she spoke with political scientists and art historians on the “Socio-Political Relevance of Contemporary Art.” Furthermore, Bauermeister participated in two exhibitions which exemplified her prominent role in shaping art of the 1950s and 1960s: Die sechziger Jahre, Kölns Weg zur Kunst-Metropole – vom Happening zum Kunstmarkt (The Sixties – Cologne’s Road to Becoming an Art Metropolis – from Happening to Art Market) at the Kölnischer Kunstverein in Cologne (1986) and Return to the Object: American and European Art from the Fifties and Sixties at the Guggenheim Museum in New York (1988). In the last two decades, Bauermeister has participated in a number of solo and group exhibitions, most notably WACK! Art and the Feminist Revolution at the Museum of Contemporary Art, Los Angeles, CA; Welten in der Schachtel (Worlds in the Box) at the Wilhelm Hack Museum in Ludwigshafen (2010); Point – Line – Plain – TV at the Nam June Paik Art Center in Seoul, South Korea; and Zero - Die internationale Kunstbewegung der 50er und 60er Jahre (The International Art Movement of the 50s and 60s) at the Martin-Gropius-Bau in Berlin. In 2018, she was included in such exhibitions as Fountain of Youth, ESPE (École supérieure du professorat et de l'éducation), Mont-Saint-Aignan, France; Giant Steps: Artists and the 1960s, Albright-Knox Art Gallery, Buffalo, NY; Light, Line, Color and Space, University at Buffalo Anderson Gallery; and Objects Like Us, The Domestic Plane: New Perspectives On Tabletop Art Objects, The Aldrich Contemporary Art Museum, Ridgefield, CT. 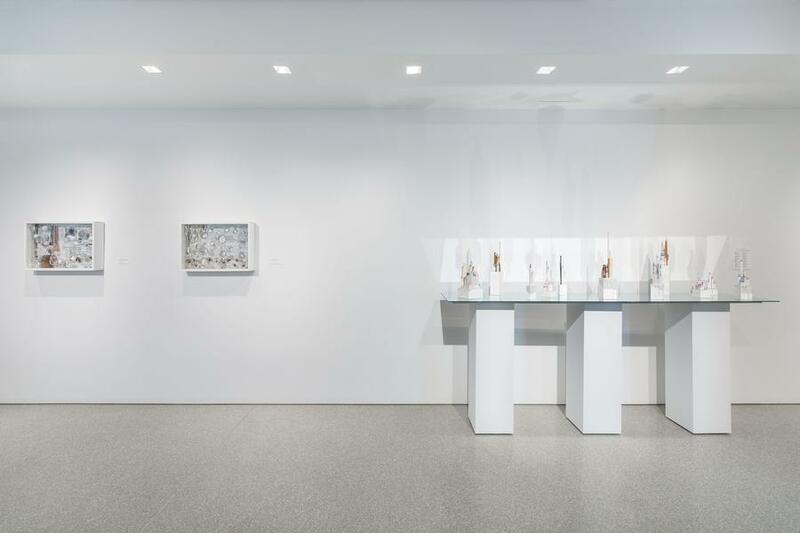 Most recently, Bauermeister was one of eight artists featured in the exhibition Art of Defiance: Radical Materials at Michael Rosenfeld Gallery. Recent solo surveys of her work include Mary Bauermeister. Die 1950er Jahre at the Leopold-Hoesch-Museum & Papiermuseum in Düren (2013); Mary Bauermeister-Da capo-Werke aus 60 Jahren at the Mittelrhein Museum (2015); Mary Bauermeister: The New York Decade at the Smith College Museum of Art, Smith College, Northampton, MA (2015); Pli Score Pli: Mary Bauermeister at the Kunstmuseum Solingen (2017); and Mary Bauermeister – Zeichen, Worte, Universen at the Kunstmuseum Villa Zanders, Bergisch Gladbach (2017). In 2011, she published her first autobiographical book, Ich hänge im Triolengitter – Mein Leben mit Karlheinz Stockhausen (Hanging in a Triplet Grid – My Life with Karlheinz Stockhausen) (Edition Elke Heidenreich bei C. Bertelsmann). Her work is represented in numerous museum collections including the Albright-Knox Art Gallery (Buffalo, NY); Baltimore Museum of Art (MD); Brooklyn Museum (NY); Hirshhorn Museum and Sculpture Garden, Smithsonian Institution (Washington, DC); LVR-LandesMuseum (Bonn, Germany); Museum of Modern Art (New York, NY); Museum Ludwig (Cologne, Germany); Solomon R. Guggenheim Museum (New York, NY); Whitney Museum of American Art (New York, NY); and Wilhelm Hack Museum (Ludwigshafen, Germany). Bauermeister continues to live and work in Rösrath, Germany, and under her guidance, the Studio of Mary Bauermeister has begun work on a Catalogue Raisonné. 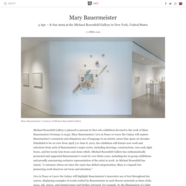 More information on Mary Bauermeister (b.1934).